—A statement to ProPublica from the Government Integrity Fund, defending its 501(c)(4) tax-exempt status despite spending more than $1 million favoring Republican Josh Mandel in his challenge against Sen. Sherrod Brown (D-Ohio). The Fund is a so-called “social welfare” group, which can’t make politics its primary purpose. What that means, exactly, has been an ongoing discussion this year. The IRS is investigating potential violators of the rule, but it hardly ever audits nonprofits. At Wednesday night’s debate, Mitt Romney declared, “I like PBS” and “I love Big Bird,” but “I am not going to keep spending money on things [we have] to borrow money from China to pay for.” (Just .00014 percent of last year’s federal budget was spent on PBS.) After the debate, the liberal super-PAC American Bridge 21st Century released two web ads hammering Romney. The one below criticizes the candidate’s offshore bank accounts, then switches to a scene showing Big Bird getting smashed by an anvil. American Bridge, which has spent more than $6 million supporting Democrats in the 2012 election, also rolled out a series of depressing images of Sesame Street characters bemoaning Romney’s policy positions. $1.84: The reduced cost, per gallon, of gas that the Koch-affiliated 501(c)(4) Americans for Prosperity has been offering on a tour that has hit Nevada, Iowa, and Michigan. The reduced cost, offered to about 100 to 150 motorists per gas station, is meant to reflect the cost of gas when Bush left office (conveniently not mentioned is that the low cost was thanks to the economic crisis). Thus far, AFP has also spent more than $30 million on ads attacking Obama. • Ralph Reed’s Group: An Obama Victory Means “He Can Complete America’s Destruction”: The nonprofit run by the ex-Christian Coalition leader blankets voters with grab bag of right-wing Obama hatred. 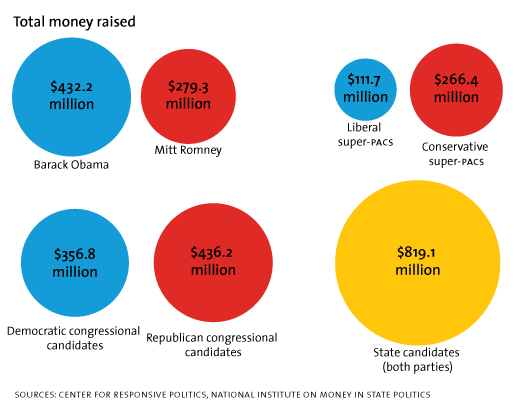 • Are Super-PACs Overhyped? : Sure, they’re blowing rich donors’ money. But don’t write them off quite so fast.